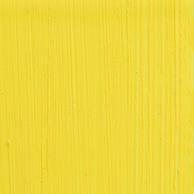 Cadmium Sulphide is a bright, tangy, high tint power yellow. An inorganic pigment which lightens and increases the opacity of warm mixes without overthrowing them. The Cadmium range of pigments was introduced into production 1840-1890, as soon as costs permitted, and has proved the most artistically reliable of all the metal compounds discovered in the 19th century.